A real experience in Africa sparks not just all five senses, but also imagination and emotions quite unlike any other place you’ll experience. Nature has been more than generous to this place, visible as much in its landscape, as in its wildlife at every turn. History has been tumultuous to say the least, emerging in recent years as a world leader in social progress and tolerance. Locals South Africans have been rebuilding a country to be proud of, while creating museums and monuments to ensure the past won’t be forgotten. Our 12 days together in South Africa will be surrounded by incredible wildlife, vistas, and opportunites to get out there and take part in some amazing activities! Some of your "must do" activities like a full day safari in Kruger Park and a full day of wine tasting in the Winelands is included in this trip, but there are plenty more opportunities to take part in too! Listed below are just a few of the activities that will be available to you during the trip. Our unhurried travel concept ensures you'll have enough time to take advantage of as much (or as little!) as you'd like to make this your trip of a lifetime! Items below are just a taste, while more details can be found in our downloadable South Africa Activities Book. There are plenty of opportunities to keep as busy as you'd like during your time in South Africa and these are just a taste! 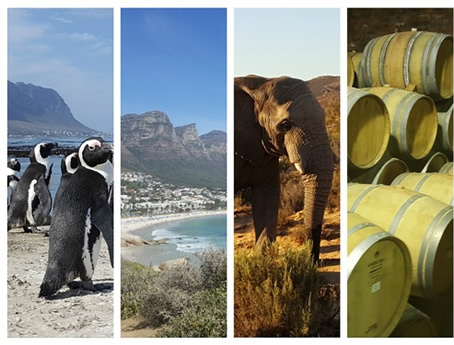 Our 12-day South Africa trips include many of the "big ticket" items of your experience, including your domestic flight, ground transportation, breakfasts and even a wine day and a safari! Check out our detailed list of inclusions and exclusions below. ** - Trip prices based on twin share. Traveling solo? We'll match you up with another traveler at no extra charge, or just pay a $770 single supplement for your own room! 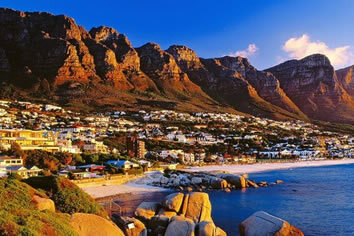 Our 12-day gay group trip through South Africa encompases the very parts of South Africa that makes it so well known! 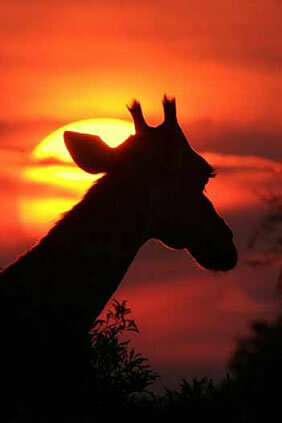 Think a safari in Kruger National Park full of lions, hippos, zebras, giraffes. 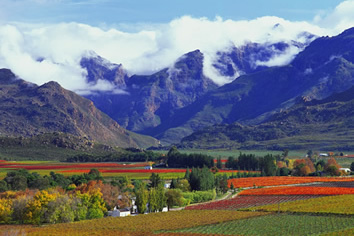 Think wine tasting in the the midst of the worlds best vineyards in the Winelands. 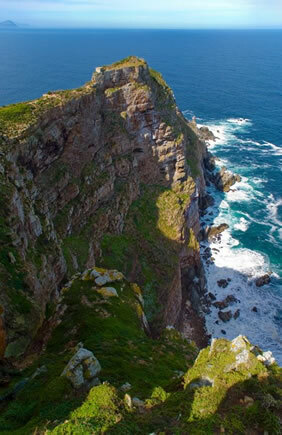 Think cosmopolitan Cape Town where you can dive with great white sharks, summit iconic Table Mountain, and walk in the footsteps of incredible history. Below is a brief itinerary of our stops, but for detailed info and available activities check out the links to the left. 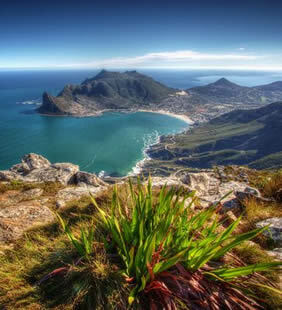 Cape Town is one of the great cosmopolitan coastal cities of the world, fringed by gorgeous beaches, with the imposing Table Mountain as its focal point. The streets are full of a wide variety of languages and colors, making up a local culture that is as varied as It fascinating to be a part of. We spend our first 4 nights here because there is so much to do! 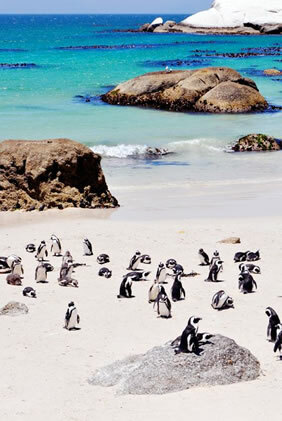 Head to the local gay beaches, up to the top of table mountain, into the water with great white sharks, out to famous Robben Island, to the penguin colonies and more! It's a city that is jam-packed with fun activities. Our first night's dinner is in the home of a local family in the Bo-kaap neighborhood who welcome us with a 3-course meal to start the trip off right! Our time in Cape Town can go in so many different directions. If you're an adrenaline junkie then this is the most famous place in the world for hopping into a cage and to come face to face with great white sharks. It's one of those "once in a lifetime" kind of experiences that'll keep your heart racing! The local history here also makes for some fascinating museums from the District 6 museum which teaches visitors about the people and events that forever affected the city, to the Iziko Museum which focuses on South Africa's cultural and biological diversity. Take a quick ferry ride out to Robben Island to explore the prison where 3 of South Africa's presidents (including Nelson Mandela) had been imprisioned during the apartheid years. Walk the V&A Waterfront, directly in front of our hotel, where you'll find a large concentration of markets, shops, and restaurants. 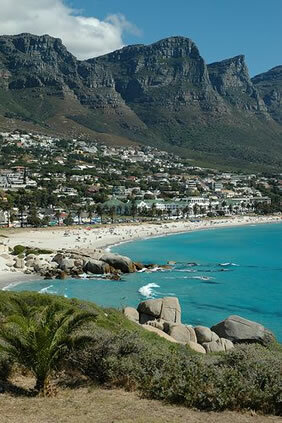 Or spend an afternoon soaking up the sun on Cape Town's white-sand gay beach, Clifton 3rd. Whether it's the history that brings you here, or the once-in-a-lifetime adventures, or the people... Cape Town is a city that will stay with you long after you leave. Our accommodation here is within the borders of Paarl, one of the three towns that make up the trifecta of stunning wine towns. The property is so small that it's only comprised of a 15 rooms in total - yet so big that it has olive groves, a waterfall, mountain biking trails, and even a spa right here on the property! It's a gorgeous setting that sets a relaxed mood for our few days here. On one of our full days in the Winelands we'll head out to the town of Franshoek and jump on board the wine train, which allows us to hop on anywhere we'd like, then hop off at any winery we'd like. We'll stop for some tastings or lunch at our favorite spots, then jump back on and do it again throughout the day! If you're not a wine-o then you're still in luck as there's great sherry tasting, beer breweries, and chocolate shops too. We love the flexibility of winery-jumping around the most incredible wineries in South Africa! A safari in Kruger Park is definitely the biggest draw to this area, but not the only draw! You can spend all your free time here in the park spotting all the exotic African animals you can think of, or you can choose to take part in some other great options in the area. Head over to the local elephant sanctuary, zip through the sky on ziplines, check out the reptile park, visit the local cultural center or even go white water rafting! After you're done getting as active as you'd like, there's always our beautiful and relaxed riverfront accommdation (complete with hammocks!) to come back to. After a drive to South Africa's largest city, we'll spend our last evening together before our 12 days of adventure comes to an end. If time before your flight permits, make sure to check out some of Johannesburg's sightseeing opportunities. We're here to assist with any post-trip excursions too! Although we don't spend much time here as a group, the city can keep you entertained if you choose to add any extra time here. 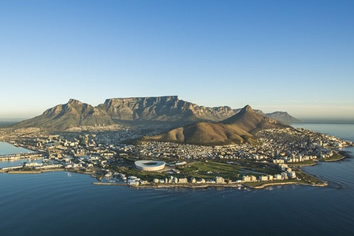 Our suggestions include the Apartheid Museum, a hop-on/hop-off bus tour, and the observation deck at Top of Africa. If you'd like to extend your trip and visit some of the other incredible sites in Southern Africa, such as the world's largest waterfall, Victoria Falls, or the giant sand dunes in Namibia, just let us know! *Note that the order of stops and duration at each location are subject to change. A former prison, located in the V&A Waterfront with easy access to the shops, eateries and destinations within the waterfront area as well as to Cape Town city centre, the nearby beaches and attractions such as Table Mountain. Dining options include the Time Out Cafe, an a la carte restaurant, and Stonebreakers, a self-service buffet restaurant, however there are a myriad of restaurants within easy walking distance from the hotel. Guests can make use of the in-house gym and the wireless hotspots that are available throughout the hotel. Located on the banks of the beautiful Sabie River in the Mpumalanga town of Hazyview, Hippo Hollow Country Estate offers luxury accommodation in a beautiful setting to guests wanting to explore the attractions of the region. 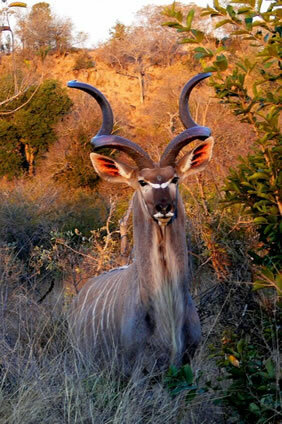 These include the famous Kruger National Park, only a 10-minute drive away. Facilities at the lodge include two large swimming pools, beautiful indigenous gardens, a curio shop and public lounge with internet access. 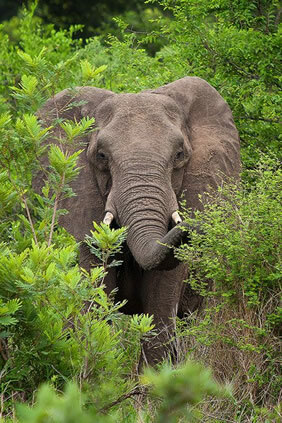 When not relaxing on the estate, guests can opt for game drives into Kruger, hot-air ballooning, elephant and horseback safaris, shopping or visits to nearby wildlife rehabilitation centres. An edgy, urban hotel that prides itself on its contemporary design and features, the Protea Hotel Fire & Ice is conveniently located close to OR Tambo International Airport and the Sandton business and shopping district with a Gautrain station within easy reach. Located in the trendy hotspot of the Melrose Arch Precinct, the hotel is surrounded by stylish shops, gourmet restaurants and various entertainment options. The energetic urban vibe of the hotel is carried through to all stylish bedrooms. Guests can dine at the modern in-house restaurant, indulge in speciality cocktails, sumptuous hamburgers or gourmet milkshakes and then work it all off in the swimming pool or fitness room. Golfing, tennis and gym facilities are all available in the vicinity of this chic hotel. An innovative 24-hour business station and free WiFi too! Got an extra few days to tack on another incredible experience you'll never forget? Take a 3 night extension trip up to Victoria Falls, the world's largest waterfall, located at the border of Zambia and Zimbabwe! We've crafted a self-guided extension to our South Africa adventure that will enable you to experience the massive falls up close and personal. Victoria Falls – known to locals as ‘The Smoke That Thunders’ – is one of the seven natural wonders of the world and the sheer power of this massive body of water plunging into the Zambezi Gorge is awe-inspiring and unforgettable. Check out of our group hotel in Johannesburg on the final day of your group trip through South Africa and jet off to Victoria Falls. Your 4-star boutique lodge sits close enough to the falls to get a mist view, while also being close enough to town to walk in just 6 minutes. All 22 rooms have a balcony giving guests a beautiful view of the impressive garden and swimming pool. On the evening of your arrival here, you won't waste any time stepping into the romance of Africa with a two-hour luxury cruise down the Zambezi River complemented by the sinking sun and host of on-board amenities. Besides the ambience on board the boat, helped along by snacks, beer, wine, and soft drinks, this is a fantastic way to get in some game viewing as animals come down to the river banks to drink. You will be collected from your hotel in the late afternoon and dropped back off after sunset. A beautiful introduction to your time in Zimbabwe. Your unforgettable day at the majestic Victoria Falls and encompassing nature reserves is truly an awe-inspiring experience. 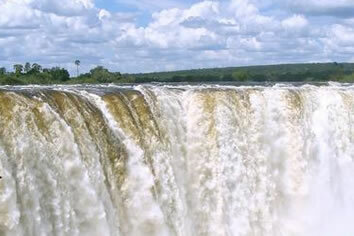 Tons of water plunge over a chasm that is nearly 2km wide falling more than 100m to the Zambezi River below. The shower of spray and the thunderous sound of the water can be heard from miles around. Today's guided tour takes you to the best view points of this iconic waterfall, one of the seven wonders of the world, allowing you to soak up the powerful and enigmatic atmosphere of Victoria Falls. Lunch after your visit around the falls is included at The Lookout, perched on the edge of the Batoka Gorge with stunning views. Even the zipliners and bungee jumpers can be watched from the outdoor patio. Take this day to relax and soak in the past couple weeks of jaw-dropping experiences you've just been a part of while sipping a drink by the pool. That, or keep it going right til the end of taking part in some of the area's other treasures. Opportunities include adrenaline-racing options such as bungee jumping from the Victoria Falls Bridge, swinging through the gorge on the gorge swing, white-water rafting down the mighty Zambezi River or taking in the falls view on a helicopter ride! If you're not looking to get your heart pounding there's always a bike tour or kayak ride that can be enjoyed too. Your final evening in Zimbabwe includes a night of local cuisine complete with dancing and drumming. Experience traditional Zimbabwean food surrounded by the sounds of Africa as your send off at the end of your trip. In enough time to catch your outbound flight, you'll be transferred back to the Victoria Falls airport, full of endless stories of your adventure of a lifetime. 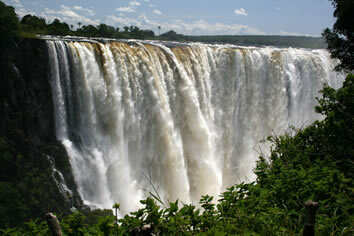 Victoria Falls Extension - What's Included? Victoria Falls Extension - What's Not Included? This epic trip extension can be added to your trip by request - just let us know and we'll be happy to set it up for you! Vegetarians may want to prepare themselves for the amount of meat that makes up a South African diet! While there are always options for vegetarians, it’s meat that makes up a good chunk of menus here. Detours doesn't believe in limiting your choices by including all of your meals at pre-decided restaurants as part of the trip package. Instead, we include all of your breakfasts to start your day off, then we explore all of the different restaurant options available for lunch and dinner. This way we can eat when we want, where we want, and spend what we want! Your trip leader definitely has their favorite spots so if you'd like some advice on the best in each location, just check with them. Our advice is simple. Pack your bag, then take half of those things out and leave them back home. It’s common to hear people wishing they’d packed less stuff, but we’ve never heard anyone complain that they didn’t bring enough. Even if you realize you forget to pack some crucial item you can always pick up a replacement once you arrive in South Africa. More packing information including a suggested packing list is included in your "Pre-trip Guidebook". Extending Your Trip For many people, 12 days in Africa just isn’t enough time. If you’re lucky enough to be able to stay longer, or if you decide to quit your job and become a lion tamer or rhino wrestler for the rest of your life, we’d be happy to help you extend (or cancel!) your return flight. We’ve been all over the area, so don’t think twice about asking where to go or what to do after your Detours trip is complete. 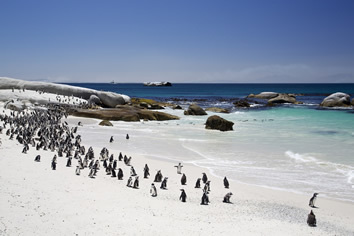 Victoria Falls, the sand dunes in Namibia, Chobe Park in Botswana... many interesting destinations are close-by. Our Detours groups are run with a minimum of 4 travelers and up to a maximum of 15 travelers. Ages of group members vary but almost all our travelers are in their 30's, 40’s and 50’s. Whatever the age of the guys on our trips everyone's already got something in common, an exciting new experience in a new country! Each group is led by a Detours trip leader who is there to ensure everything goes off without a hitch, allowing you to focus on having the time of your life! We welcome both men and women onto our trips although it’s important to know that most groups are 100% gay men. The areas of South Africa that we'll be visiting are very open-minded and most people will be very welcoming of homosexuality. That said, South Africa is a small pocket of gay friendly attitudes, in a continent known for quite the opposite. For that reason, we do suggest being cautious about the amount of excitement and passion you have for your partner or new local “friend”. Relax – we won’t keep you from updating your Facebook status and Tweeting zebra pics the whole trip. There is free WiFi all over the place and available at every hotel we stay at. If you’re more the “E.T.” type and would just rather call home, feel free to pick up a calling card at a corner store and make use of the many local payphones. Alternatively, if your mobile phone is "unlocked" you can pick up a local SIM card which is quite affordable and very simple to set up once you arrive in South Africa. 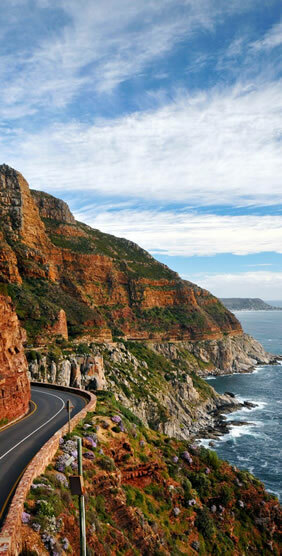 South Africa is actually a surprisingly affordable country once you're here! Especially when compared to many European countries and North America. Your personal spending on the trip will include the costs for most of your lunches and dinners, entertainment, and shopping. We recommend that you budget $500 - $700 for all of your expenses during the 12 days. This amount should be plenty to cover all of your expenses while you're here. • The low end of $500 budgets for eating all meals at restaurants, some souvenir shopping, doing activities, and some nightlife, but it is for a more budget conscious traveler. • $700 on the other hand is for someone who plans to be more careless with their spending, or because they want to do all of the activities available. • We must mention that there are also travelers who spend even much more than $700, but the bulk of that spending would come from spending extravagantly or shopping to the extreme! Further information can be found in your "Trip Preparations" guidebook which will be available to you after your trip signup. 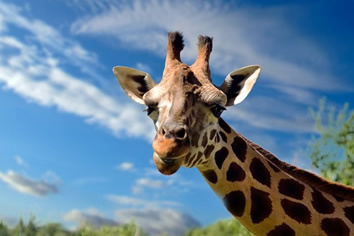 However, if you have any further questions about your South African experience please visit our FAQ page or contact us. Price does not include 3% payment card charges. No additional charges on bank transfer payments. Web Page © Happy Travel, Ltd. Logos and Images © Atlantis Events Inc., Detours, etc.